About a year ago, we started printing our logo and Etsy shop name directly on our shipping labels. It was a small effort that we feel resulted in huge strides for the professional image and branding of our business. In this post, we’ve laid out the steps you can follow to personalize your own shipping labels using Endicia. If you’re not an Endicia user, you should give them a try. 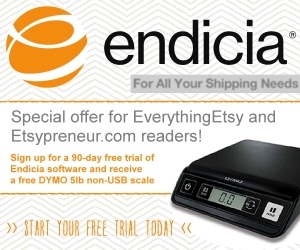 Endicia is a long-term sponsor of EverythingEtsy.com and has continually offered our readers — YOU — a great special trial offer of 90 days free and a free digital scale with no commitment. Hard to beat the offer and, as you can see below, just this one little feature can make a positive impact on your business. We use Endicia Professional which comes with a powerful software called DAZzle which has the ability to customize labels with graphics, “rubber stamps” for common postal messages such as Air Mail, and textboxes for your own text. We first started doing this with our logo in color and the packages were all delivered fine. But one day I decided to ask the post office staff to look at our custom label and give me any feedback they might have. The two bits of advice were to make the logo black and white to make it more compatible with automated machinery and to make it a little smaller than I had it at the time. So the first step is to make your existing logo Black and White. You can use most image editors to do this. Or if you’re familiar with Photoshop, it’s just a few easy clicks. The instructions for Photoshop are below, or look here for how to make images black and white using free tools. Open your logo file in Photoshop. From the Panel Menu on the right, you can usually find the Adjustment panel. Or if it’s not docked there you can always go to Window > Adjustments to make it active. Find Black & White adjustment in the panel and click it. Your logo is now black and white. In the properties window that pops out, you can adjust the level of how black and white your logo is by adjusting the colors that are present in your logo before it turns black and white. From the image above, adjusting Cyans will make different levels of black and white on your logo. I usually choose jpg out of habit because it’s a smaller file for websites, but you can use whichever you prefer. Go to File > Save. Type the file name of your image and select the file type from the dropdown. Choose “JPEG (*.JPG;*JPEG;*.JPE). Save it to your Desktop. You now have the black and white version of your logo on the Desktop. It’s time to go make a new layout. Open DAZzle and from the tab just right above the ruler, select Design. By default, you probably have the “Click n Ship” Label layout open which is a half-sheet label size, perfect for printing on plain paper or full sheet labels. We found full-sheet labels to be a wonderful time saver until we started using a dedicated label printer, which is the fastest and easiest way to go by far. If you have opened a different layout and you want to go back to the default layout, just go to File > Open Layout. Find Click n Ship Label and open it. Let’s modify this by adding your logo and the name of your Etsy store. You can remove elements, like the USPS and Endicia logos at the bottom of the layout by clicking on each and hitting Delete on your keyboard. To add your logo, hit Insert from the main menu tab and select graphic. Choose your logo and open it. There will be a pop out window that tells you what type of image you are opening and the size of graphic option. Just paste it anywhere, resize and drag it to the bottom right of the address box, just above the solid black line that marks the top of the USPS tracking barcode area. NOTE: Your label will also have a return address showing and the SHIP TO: address will be lower. It looks this way in the pictures because I used a non-registered installation of the program for the purposes of the tutorial only. Easier than trying to cover any personal information in the video and images. It’s important to keep your logo well clear of any areas that have to be read by machines, which includes the addresses and the scan codes. Next, to add the name of your shop, add a text box by going to Insert and select Text Box. In the window that pops out, type the URL of your website or name of your shop. Paste it at the very bottom of the label, below the USPS scan code area. You can move it by dragging or using your arrow keys. You are now ready to save your custom layout. Go to File > Save Layout As, type in a name you’ll remember and click Save. If you use Save and not Save As, you’ll overwrite the default Click N Ship label and your new label will be the default. Once your Endicia account is all set-up and connected, and you’ve added some funds to cover postage, you can print your prepaid shipping labels easily using either a dedicated label printer or a standard plain paper printer. Stick it on your next outbound order and feel the pride of having your own custom shipping labels. It’s really pretty cool. Go you! Wow, you make this whole process look really easy. 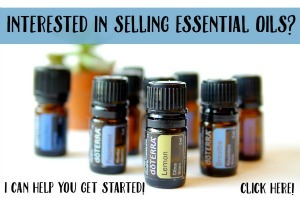 I’ve been thinking about starting my own business recently. I think that the hardest thing is to build up your brand. You have to have a creative logo that stands out though. That’s the biggest trick. 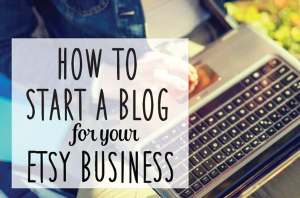 This step-by-step on how to customize your label is very helpful. My friend is just starting a company, and he was showing me his layout designs. I’m going to send him this article because I think it’ll be useful for him. Thanks Tim!